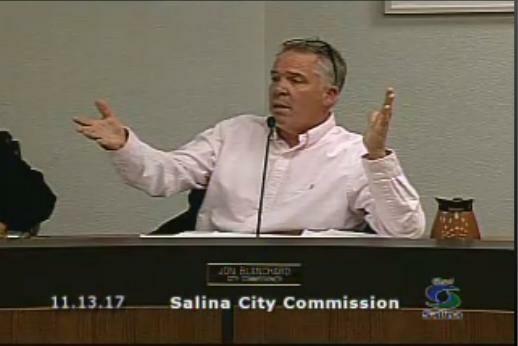 Monday’s Salina City Commission became contentious as it was winding down when the mayor accused a commissioner of an ethics violation. Salina Mayor Kaye Crawford said that she was troubled that commissioner Jon Blanchard released documents which contained confidential information discussed during an executive session. The information in question is in regard to discussions in 2014 between the City and the Salina Area Chamber of Commerce which ended with a significant reduction in chamber funding and the formation of a new economic development organization. Blanchard obtained the information, a portion of which was redacted, via a personal open records request. Crawford was concerned that Blanchard personally released the information without first consulting the other commissioners. Commissioner Karl Ryan agreed. Blanchard admitted that it was an ethics violation. City Counselor Greg Bengston said that the violation is not a crime, but rather a violation of city commission policy. Blanchard released the information during the just completed election, along with other documents including campaign finance reports, which he obtained via open record’s requests. During an exchange which became contentious at times, after admitting his violation Blanchard accused commissioner Ryan of ethics violations as well. He alleged that Ryan did not recuse himself from certain votes when he should have because of conflict of interest concerns. By a 5-0 vote the commission decided to put the ethic’s violations issue on the agenda for next week’s meeting for open discussion, and possible action.